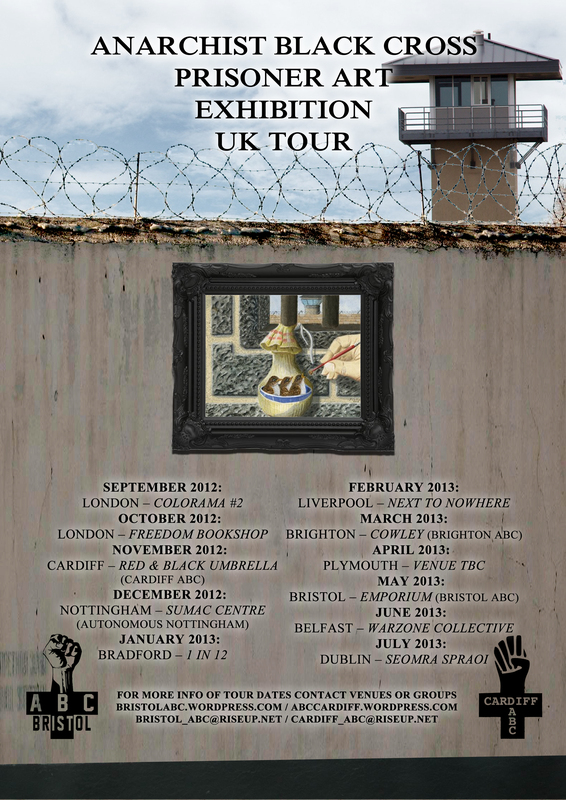 After a debut viewing at Kebele Social Centre in Bristol, the Anarchist Black Cross Prisoner Art Exhibition in September 2012 began it’s UK tour; visiting 13 venues in 10 cities across England, Wales and Ireland over 11 months. The exhibition features over 30 pieces, as well as poetry, from current and past radical prisoners including – Phil Africa, Peter Collins, Lucy Edkins, David Gilbert, Alvaro Luna Hernandez Hier and Thomas Meyer-Falk. The tour aims to show the artistic and poetic talent of those behind bars, as well as highlighting the political cases of the prisoners themselves. Additionally the exhibition features a wealth of sketches and writings from a Close Supervision Centre (CSC) prisoner, yet to be revealed. Since the beginning of the 20th Century the Anarchist Black Cross (ABC) has been on the frontline supporting and showing solidarity for those imprisoned for struggling for freedom and liberty. The organisation has by many states been deemed illegal, “terrorist” and many members have been tortured, killed, arrested, imprisoned, and fled persecution. ABC in the early years took part in the 1905 Russian Revolution (where six members were imprisoned), organised defensive units under the anarchist Black Army in Ukraine, fought against the Bolsheviks regime a decade later, and aided anarchists fleeing fascism during the Spanish Civil War and Second World War in the 1930’s. After it’s revival in 1967 in England to aid prisoners of the Spanish resistance, ABC eventually grew into a global network of anarchist prisoner support groups; organising international days of solidarity, letter writing nights, prison demos, financial aid for prisoners, art shows, supporting struggles inside (and on top) of the prisons, and much more.